A recent study at the University of California Davis found a correlation between fetal and infant exposure to pesticides, household chemicals, and viruses and the rise of children diagnosed with autism. In the past, vaccinations were a suspected link to increased autism due to the mercury-derived preservative thimerosal, but that chemical has not been used in vaccines since 1999. Autism rates are still on the rise. Better diagnosis has also been discussed as a reason for the increase, but researchers say that a jump this large can’t be attributed to diagnosis alone. California has seen autism diagnosis jump by 700%, and researchers are now saying that environmental factors are likely the culprits. In addition to pesticides, researchers found that mothers of autistic children were more likely to use certain household chemicals, such as pet flea shampoos or vinyl and cosmetic products containing phthalates. Household and personal care products like antibacterial soap also have chemicals that can affect brain and immune system development. Flame retardants, like you’d find on furniture or in many electronics are also suspect. This is another case of, as Colin Beavan would say, what’s good for the planet being what’s good for its inhabitants. You can protect yourself and the children in your life by trying to minimize these chemicals’ presences in your home. Finding furniture and housewares made from natural materials is a good start. You might also want to overhaul your personal and household cleaning supply. Instead of your typical antibacterial soap full of unpronounceable ingredients, hit your local health food store or co-op for a more natural option. Dr. Bronners makes liquid and bar soaps that are pretty easy on the wallet. You might also scope out personal care products from smaller companies that focus on natural ingredients, like Rinse Soap, which is a favorite in our house! 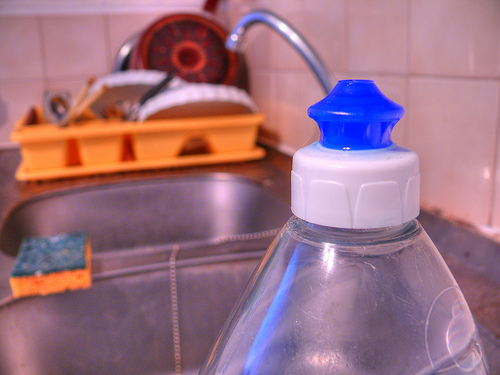 Try replacing your cleaning supplies with eco-friendly ones from companies like Seventh Generation or Mrs. Meyers. If the price tag for some of these cleaning products seems a bit hefty, it’s really easy to make your own! Check out this great list of home made cleaning supply recipes from Organized Home! Once you get started, it’s pretty easy to get those nasty chemicals out of your house and replace them with products that you can feel good about using! Read more about this new study over at Eco Child’s Play.